New Delhi: We are delighted to enter in the seventh year of the Indian Restaurant Congress 2017 which will be held on 28th- 29th August at JW Marriott, Aerocity, Delhi. Indian Restaurant Congress 2017 is the leading Business and Knowledge platform for the restaurant and food industry. Zorawar Kalra, Founder and Managing Director, Massive Restaurants Pvt Ltd, Conference Chairperson for the Indian Restaurant Congress 2017 says “Culinary innovation and contemporary presentation should be the key focus for restaurants in the coming year. Chefs and restaurants should also back to their roots for bringing out the traditional, lesser known dishes to the forefront and contemporising them for today's well-travelled, curious and adventurous diners, to deliver a stellar dining experience”. This year restaurateurs, chefs and industry leaders who will grace the two day event with their presence are Celebrity Chef Ranveer Brar, Mr. Unnat Varma (MD, Pizza Hut- India Subcontinent), Celebrity Chef Ranveer Brar, Mr. Unnat Varma (MD, Pizza Hut- India Subcontinent), Mr. Ashish Kapur (Founder & Director, Moods Hospitality Pvt. Ltd.), Mr. Sameer Bhasin (CEO, Barbeque Nation), Mr. Varun Tuli (Director, Yum Yum Cha) to a name of few. "Today consumers who are drawn to an experiential dining experience are willing to pay more, too. 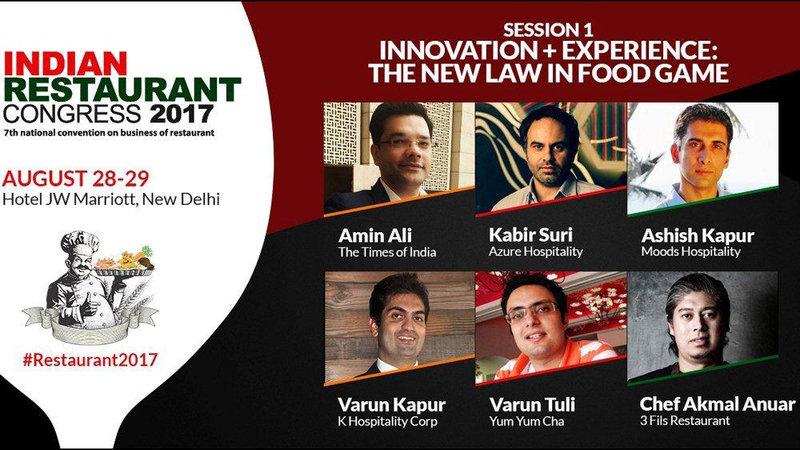 Indian Restaurant Congress 2017 will share the building blocks of the food service in an innovative ecosystem. It is the platform where restaurants, chefs, brands would find future business models and ideas to address tomorrow's market demand", says Ms. Ritu Marya, Director and Conference Convener, Franchise India. The Theme for Indian Restaurant Congress 2017 would revolve on ‘Experience’ including- Food, Service, Design, delivery and the Digital Experience and new ways of engagement of the customer with the brand. Highlights from the event include the sessions that would focus on every single aspect that helps in building a Restaurant Experience – Food Trends, The new law in food game, Innovation etc. On the sidelines of the main conference, there will be a BAR & Cigar Summit on 29th evening followed by, CHAI & BUN Summit on 30th morning. For the first time, Indian Restaurant Congress is also having a session on Tech Munch which will be attended by the renowned Digital Food Influencers and Food Critics.